On September 20, 2014, while corporate and government officials arrived in New York City for the UN Climate Summit, organizers and activists from around the world participated in a peoples’ summit called the NYC Climate Convergence (organized by the Global Climate Convergence and System Change Not Climate Change). The NYC Climate Convergence featured as the lead keynote speaker Naomi Klein, who presented the analysis of her new book, This Changes Everything: Capitalism vs. the Climate (Simon and Schuster, 2014). Her concluding chapter, significantly, is entitled “Leap Years: Just Enough Time for the Impossible.” Monthly Review readers will be interested that Klein observes in her book: “Karl Marx… recognized capitalism’s ‘irreparable rift’ with the ‘natural laws of life itself’” (177—though she chooses to do so in a section criticizing the “The Extractivist Left” in South America). Later she refers to “global capitalism’s voracious metabolism” (186). 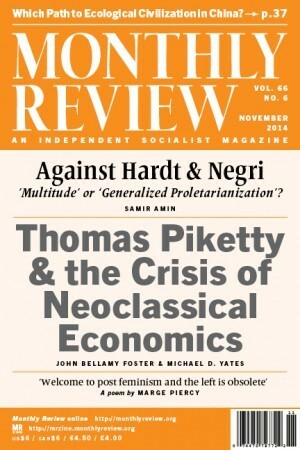 Monthly Review had a strong presence in the NYC Climate Convergence with Fred Magdoff speaking on “Capitalism Is the Problem” and John Bellamy Foster on “Marx and Climate Change.” (Magdoff and Foster are coauthors of What Every Environmentalist Needs to Know About Capitalism [Monthly Review Press, 2011]. For more information on their book go to https://monthlyreview.org/books/pb2419/.) Other MR authors who spoke at the NYC convergence included Patrick Bond, Jeremy Brecher, Doug Henwood, Joel Kovel, Roxanne Dunbar Ortiz, Christian Parenti, Lauren Regan, Brian Tokar, and Victor Wallis. The following day was given over to a march and protest organized by the Global Climate Convergence, in which over 300,000 people participated, constituting the largest climate demonstration yet in the United States. Many MR readers will be drawn to a new book by James K. Galbraith, The End of Normal: The Great Crisis and the Future of Growth (Simon and Schuster, 2014). Galbraith’s title is intended to refer to the end of the “easy growth” that was associated with the early post-Second World War economy. Of course “the end of normal” in the sense that he uses it here is more of a hegemonic state of mind than a reality, since the so-called “golden age of growth” represented a brief period that ended some forty years ago and is now a distant memory. In truth, stagnation is “the normal state of monopoly capitalism”—a view set out by Paul Baran and Paul Sweezy in Monopoly Capital (Monthly Review Press, 1966). Galbraith commends Baran and Sweezy several times in his text. In the early post-Second World War decades, he writes, “it took a brave and even self-marginalizing economist willing to risk professional isolation in the mold of Paul Baran and Paul Sweezy to deny” that a stable system of economic advance was assured in the future—a view which had become an article of faith in the economics profession (25). Later he reiterates “Paul Sweezy and Paul Baran…already in the 1950s, were writing skeptically about growth theory” (74). Galbraith is no Marxist, but a radical institutionalist economist in the tradition of Thorstein Veblen and John Kenneth Galbraith (James’s father). Still, many of his conclusions in his new book overlap with ours—not surprisingly since reality has a way of asserting itself and Galbraith’s political sympathies are firmly with the people. 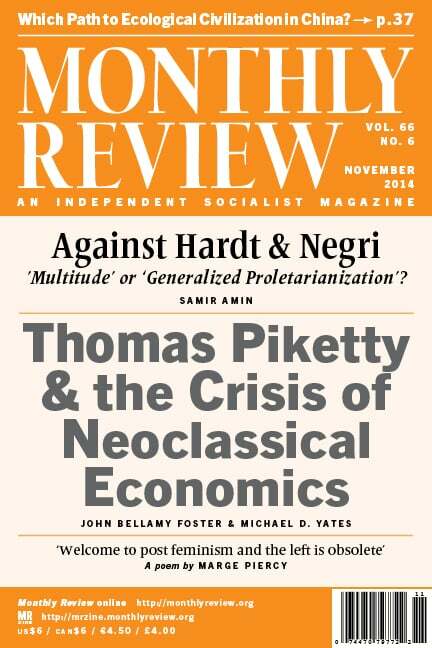 As indicated in this issue’s Review of the Month, “Piketty and the Crisis of Neoclassical Economics,” by Foster and Michael D. Yates, Galbraith pioneered the analysis of pay inequality in two previous books—Created Unequal (Free Press, 1998) and Inequality and Instability (Oxford University Press, 2012). In The End of Normal, Galbraith shifts from inequality to uncertain growth and financial instability. He is highly critical of popular analyses of the Great Financial Crisis that focus on financial fraud and failures in regulation—as if the financial crisis were simply a big mistake or as if mounting government debt were somehow the main source of the problem. Rather Galbraith points, if somewhat vaguely, to the underlying problems of the real economy that lay behind the crisis and constitute its cause—while also emphasizing that we should pay attention to the ins and outs of the financial system. Remarkably, he criticizes those like Paul Krugman and Joseph Stiglitz who think that old-fashioned Keynesian demand management will solve the problems of the economy. John Bellamy Foster and Robert McChesney (2012) are Marxian early adopters of the there-will-be-no recovery position. But while their book The Endless Crisis follows Paul Baran and Paul Sweezy in recognizing the role of finance capital in the modern system, the crisis that they identify is not, strictly speaking, a financial crisis. In their analysis, finance is part of the burden on the economic system, and the resulting rise in inequality, alongside low growth of wages, is a cause of the unmanageable expansion of household debts. Yet the crisis itself, as identified by Foster and McChesney is a crisis of monopolism, of overaccumulation of capital, and of the excessive size of the financial in relationship to the “productive” sector of the economy, along with the phenomenon of “superexploitation” associated (they argue) with the move of manufacturing industry to China. What happened within the financial sector, and to the financial sector, and what was done by the financial sector, appear almost incidental and are barely analyzed in their book. (77). Later on he notes that Foster and McChesney, though “they cannot be accused of gilding lilies….make no reference to the role of financial fraud” (156). His criticisms here of Foster and McChesney’s book for neglecting the nitty-gritty of finance are somewhat exaggerated—no doubt for effect. For one thing The Endless Crisis includes a chapter, “The Financialization of Accumulation,” which seeks to explain the history and theory of financialization, rooted in the contrasting views of Keynes, Minsky, and Sweezy. There are a lot of specifics provided on the political economy of financialization here and elsewhere in the book. Moreover, The Endless Crisis was written as a kind of sequel to Foster and Fred Magdoff’s, The Great Financial Crisis (Monthly Review Press, 2009), which was chock full of details on the expansion of debt, the growth of financial instruments, and the phases of the finance cycle. Neither of these works, it is true, emphasizes fraud, preferring to focus on core institutional characteristics of the system itself. However, MR readers interested in this aspect of the crisis of our time could not do better than to read William K. Tabb’s “The Criminality of Wall Street” in the September issue of MR. Still, we believe that Galbraith’s criticisms are in some ways justified. It is true that Foster and McChesney’s The Endless Crisis (as opposed to Foster and Magdoff’s earlier book, The Great Financial Crisis) downplays the financial crisis itself, pushing it into the background. This is because their main message is that, with financialization stalled for the present, stagnation now occupies center stage. This can be succinctly summed up—using what has become a common literary device—as “It’s Stagnation, Stupid!” Financialization is important, but it exists in a dialectical relation with the underlying tendency towards overaccumulation and stagnation—the primary historical contradiction of the rich capitalist economies in our time. All MR subscribers will by now have received the MR Associates Fall appeal. Many of you already have responded and sent in your new or enhanced Associate membership. But for those who have not yet done so, it is not too late, and we look forward to your response. It is your support by becoming an MR Associate, or enhancing your present Associate status, that more than anything else keeps MR alive. Even in the digital age, academic journal articles are inaccessible to most people because they require access to a university research library. Hence, MR editor John Bellamy Foster has set up a personal web page, making articles and book chapters that he has written for academic publications—often coauthored with other MR authors, including Paul Burkett, Brett Clark, Michael Dawson, Hannah Holleman, R. Jamil Jonna, Robert W. McChesney, and Richard York—accessible to readers more generally. This new web page can be found at http://johnbellamyfoster.org. Corrections: In the September 2014 Notes from the Editors we listed MR authors who had contributed to the special July 2014 issue of Socialism & Democracy on the 150th Anniversary of the International Working Men’s Association, but in the process we accidentally left off the name of Michael Joseph Roberto, who contributed an important article to the special issue addressing “Capitalist Crisis, Cooperative Labor, and the Conquest of Political Power: Marx’s ‘Inaugural Address’ (1864) and Its Relevance in the Current Moment.” Roberto is also recently the author of “Crisis, Recovery, and the Transitional Economy: The Struggle for Cooperative Ownership in Greensboro, North Carolina,” Monthly Review, May 2014.